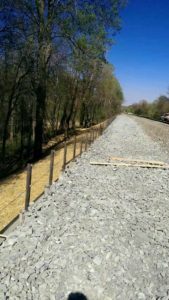 To rectify a slip along a section of railway track a wall was required. 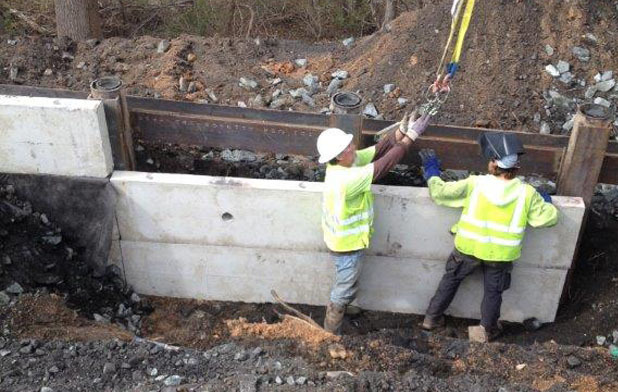 Due to space constraints, a pipe pile and lagging wall installation was deemed appropriate to accomplish the task. 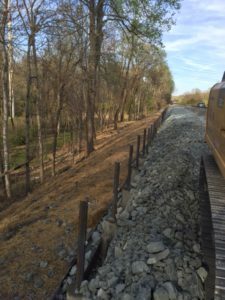 A wall needed to be constructed to properly repair and remediate the failing slip alongside a section of the railroad tracks. Conventional installation techniques were not possible due to limited space for equipment on the hillside. 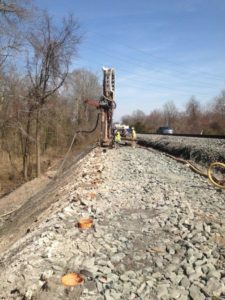 The railroad maintains and operates thousands of miles of track throughout this portion of the Eastern US and many surrounding areas exhibiting signs of wear. 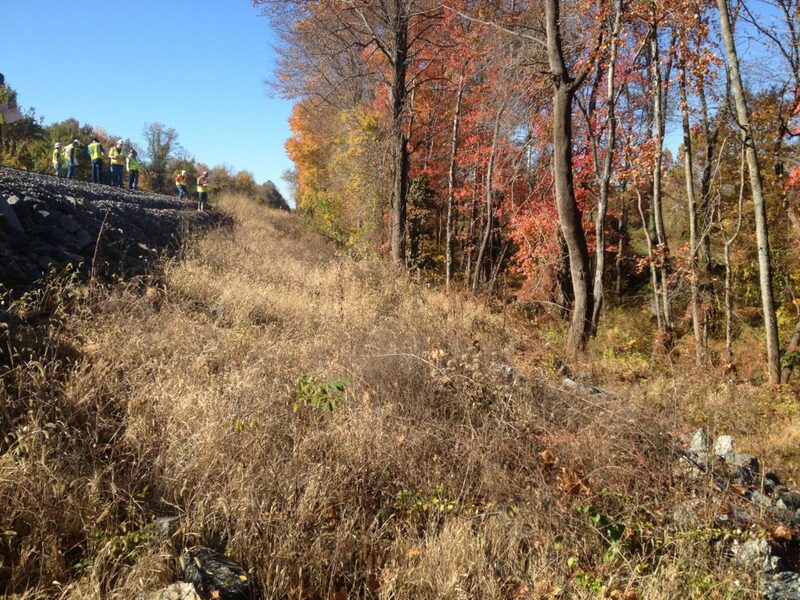 Deterioration of the existing hillsides along the tracks require remediation through precision drilling and installation of retaining walls. 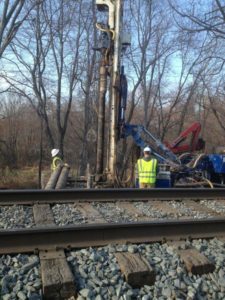 Coastal Drilling was tasked by the railroad to remediate a slide along a section of track. Due to the topography of the site, workspace was very limited. 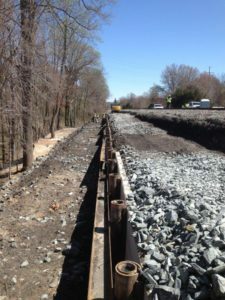 Therefore, Coastal elected to design and install a pipe pile and lagging wall to alleviate this concern. The site work began with installation of an appropriate workbench. 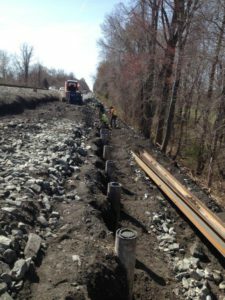 The holes were drilled and 9-5/8” pipe, 50 feet in length, on 6-foot centers was installed. 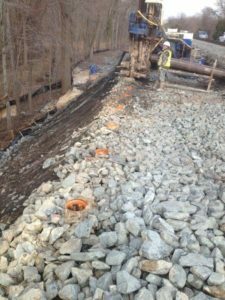 Prior to grouting, sections of 30 foot 7” diameter casing were inserted. Then, angle for the handrail was installed and all was grouted into place with 3000 psi minimum cement grout mix. 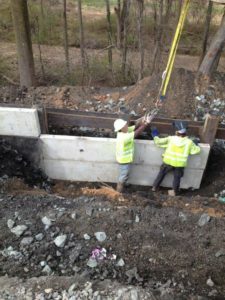 The walers were welded to the C-Channels, concrete panels were positioned and stone for backfill was placed behind the wall. 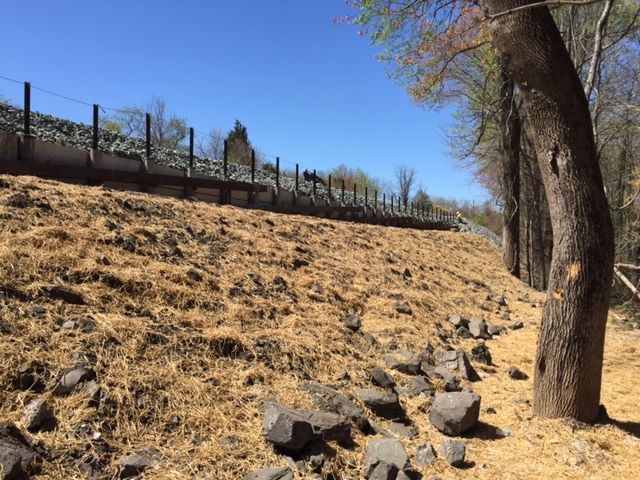 Upon completion, the slope was graded and the site was seeded and restored.